Nothing instantly says “luxe” like an all-marble bathroom. It is one of my absolute, all-time favorite looks and what I intend to do when I finally get to do a master bathroom of my own. I’m working on a master bathroom for a client right now where we are tiling the whole thing. I can’t wait to show you, but that will be another post. If you’re new here this week or you missed last week, please be sure to first read 2 Common Tile Mistakes in the Bathroom … and How to Avoid Them. All done? Ok. Now, let’s get to today’s topic. Let me say first that I don’t always buy online, even though that’s the topic of this post. I really do like to keep my business as local as possible. There are many things to be said by working with your local tile shop, including service, expertise, seeing the selection. These things are worth paying for. For example, I am ordering all of my marble tile for my client (and there will be a lot!) from my local store. Why? Service: My local store can get pictures of the actual marble lot from which I’ll be ordering. Natural stone can vary widely in color, and I want the marble to be as consistent in color as possible. Online won’t do that for you. You just have to order more and hope for the best. Expertise: My local reps can advise in so many ways — the best sealers, the best installers, delivery, how to work around weird corners, even steering you toward a different, and perhaps better, tile for your project. Seeing the Selection: Many of the most gorgeous tile sources — like New Ravenna, a favorite mosaic company of mine — only sell through retail outlets. Also, what looks great online may s*** in person. Know how it’s hard to shop fabrics online? You can’t get a true idea of color or feel. Same thing here. Like these beauties? Read on! Please, don’t under-shop your local store if they’ve given lots of service (i.e. you went there and asked tons of questions and they spent tons of time with you) by going online. If everyone did that, they’d go out of business. That being said, if you have upscale taste in tile but don’t have an upscale tile store near you (I actually have to drive 45 minutes), or if you (like me) have champagne taste but a beer budget, or if you are a web shopping fiend, these sources may be of interest to you. The Builder Depot does the majority of its tile business in natural stone of various kinds. 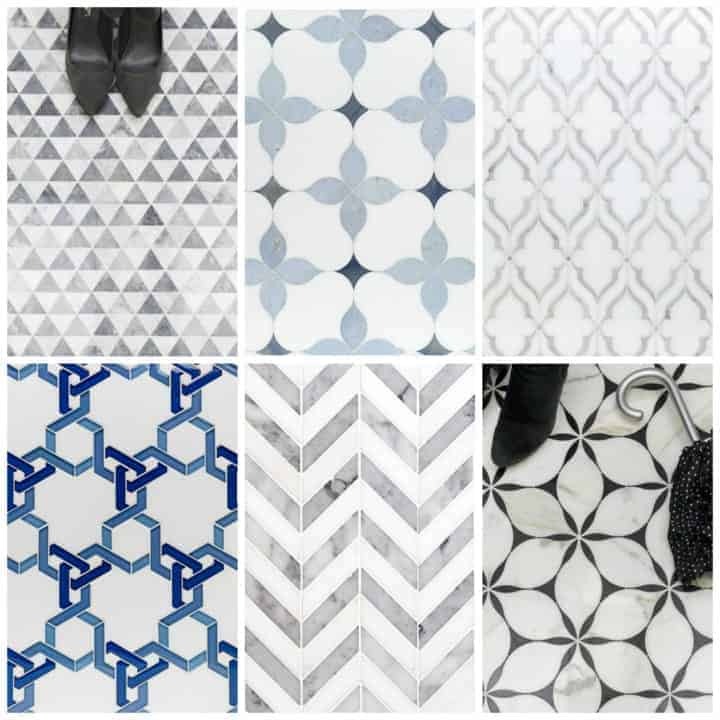 I have found no cheaper, better organized online source for marble tile that has such a selection of mosaic patterns and detail pieces like pencil liners, chair rails, and base board moldings, all within the same type of marble. There are three of their own lines of carrara — Venato, Bianco (whiter, less veining — perhaps their version of Asian statuary? Just a guess. ), and Pietra — along with a line of calacatta marble. I got samples of the calacatta for my own reference, and it is beautiful. Studio O Interiors hit the “luxe” note to perfection in the bathroom above using marble from The Builder Depot. Notice how Studio O used a simple border around the chevron floor — but the border goes around all the corners!! The chevron is NOT just a rectangle in the middle of the floor. Carrara tiles of all shapes and patterns start at $7.00 sf and calacatta tiles range from $14.95 sf for subway sizes to $27.95 sf for heavy base moldings. 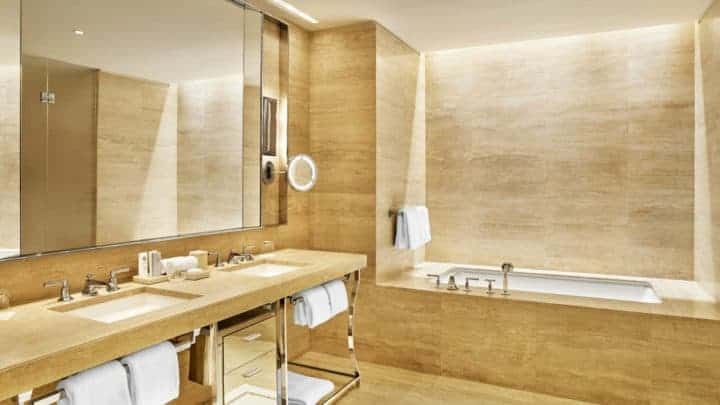 From what I’ve read, the glorious bathroom above is in a kind of marble called “White Oak.” Beautiful and zen, no? Looks like it might be 6″ x 24″ tiles stacked on top of one another — not offset. Builder Depot has a large selection of their own version of White Oak marble called Silver Cream. It’s more gray than the above (yellowish color could be due to lighting), but really beautiful and comes in myriad rectangular sizes and mosaics including hexagon, chevron (gorgeous! ), herringbone, arabesque, basket weave, and various molding trims. Prices range from $6.75-$19.95 sf. I SOOOOO want another bathroom to do so I can try this product. This would be awesome in a California cool project. I’ve known about Floor & Decor for a couple of years now, thanks to sponsored posts by Little Green Notebook and Emily Henderson. I previously discounted it, though, because the nearest stores to me are about 6 hours away in New Jersey and Pennsylvania. (What?! New Hampshire isn’t a hopping enough market for you?) Nowadays, their online inventory is much more extensive, though not nearly as well organized as The Builder Depot, and they’ll mail you samples. Score! Warning to the online shopper: always order samples. Most stores private label natural stones in their own ways, so it’s hard to know if you’re ordering Italian carrara, Asian statuary (carrara like but less veining), thassos, or something else. You want to keep your type of marble consistent. Case in point — in Floor & Decor’s online marble inventory, there is classic bianco, bianco orion, bianco carrara, carrara white, ocean white, sahara carrara… and more. Get the idea? And they don’t all come in various shapes and sizes, which can make it hard to come up with a full bathroom design. 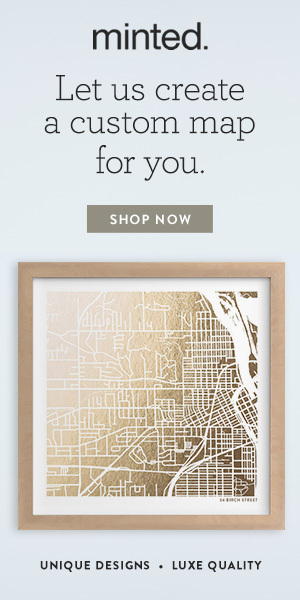 Though Floor & Decor is the absolute cheapest source out there, this super-confusing aspect of their website makes it less of a go-to for me. Perhaps it’s easier if you’re in the store. Floor & Decor has a few upscale things that have caught my eye, though, and I’m divulging them to you! Remember this bathroom from last week’s post? Well, Floor & Decor doesn’t have this stunning New Ravenna chevron pattern, but they do have this adorable carrara/thassos pattern in both floor and border patterns. Add a carrara chair rail or pencil and wall tile and you have something similar to the New Ravenna bathroom, albeit a bit more grey because of the carrara. The overall look is more cottage-like, too, but I think tasteful and cheerful to boot. Bring out hints of the blue marble in sconce shades, towel trim, a Roman window shade, or paint above the wainscot! I also found the below gorgeous waterjet thassos/carrara mosaic pattern …. which I’m almost willing to bet my firstborn child is New Ravenna’s Sophie pattern. Ignore that ugly mirror — Sophie looks glorious as a sink accent wall. New Ravenna mosaics usually start at around $80 sf, but Floor & Decor has this single pattern for $39.99! (Is that expensive? Heck, yes! But I said “luxe for less,” NOT “design on a dime.”) Add a carrara or thassos floor and you’re set. I’m also a little obsessed with the Skyfall marble, which comes in a chevron and two sizes of rectangle. Anne Sacks calls its version Asher Grey, others call it Linac, some Marmara. I told you — private labels make things impossible to match up! I love Tile Bar, and not only for marble! There is a great selection of carpet-like tiles (Sounds weird, but they’re really cool. Kind of like a textured slate look, great for an industrial farmhouse bathroom floor) and a selection of porcelain marble tile look-a-likes, like the Traverse (kind of like the white oak), Versilia (statuario and calacatta), and Simple White (thassos). Nope! This fabulousness was concocted by Amie Corley Interiors from the Versilia Calacatta Gold collection. Pretty sweet. The price difference between real marble isn’t enormous, but you have the added benefit of not having to take care of marble. When it comes to these porcelain tiles, I would definitely go for the polished look over the honed. Tilebar’s selection of marble mosaics is wonderful. They aren’t cheap ($40-$300 sf), but most range around $70-$90 sf. Again, compare the price to $115+ retail, and there is a savings. There’s also a coupon corner, where you’ll save from $10 off a purchase of $250 up to savings of $250 off a purchase of $1999 or more. Some of my favorite marble tile mosaics, ranging from $22.50-$93 sf. Whew! There you have it! I’m officially in love with bathroom tile, and if you would like me to put together something unique for you, drop me a line. Next week, one of the hottest trends in kitchens is actually completely classic. There is nothing new under the sun, only new twists. ‘Til Saturday!